5. 12. 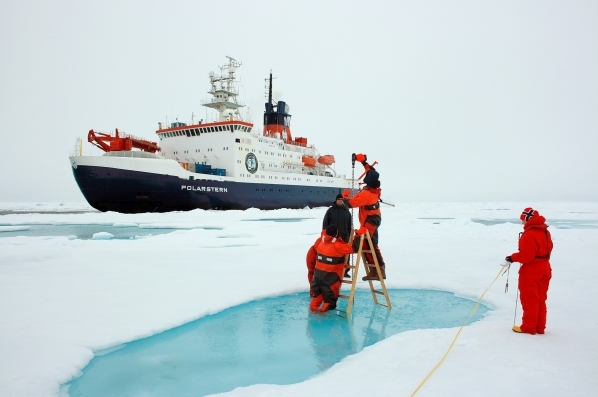 2012 | This fall, the research icebreaker "Polarstern" returned after two months at sea. 54 scientists and technicians from twelve nations collected data on the retreat of the sea ice and the consequences for the Arctic Ocean and its ecosystems. Several new technologies were used to film and photograph life in and below the ice, down to a depth of 4,400 metres. During her expedition, the Polarstern ("Polar Star") has travelled more than 12,000 kilometres and stopped at 36 stations. At nine ice stations, the ship moored for several days to examine the ice, the water beneath it, and the sea bottom. With the so-called "EM-Bird", an electromagnetic sensor to record the thickness of sea ice, 3,500 kilometres of sea ice were measured from a helicopter. The researchers determined that the multiyear sea ice had declined considerably. Already in July 2012, the Siberian shelves were ice-free, whereas in the summer of 2011, the Polarstern had still encountered multiyear ice in this region. As a result of the melting ice, the fresh water content of the sea surface has increased. "The Arctic of the future will consist of thinner sea ice, which will therefore survive the summer less frequently, will drift more quickly and permit more light to reach the ocean. This will lead to great changes in the composition of sea life", professor Antje Boetius explains, head of the expedition and of the joined Helmholtz-Max-Planck research group for Deep-sea Ecology and Technology at the Alfred Wegener Institute (AWI). 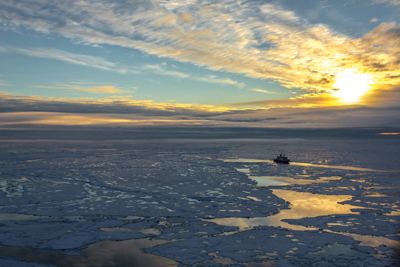 For the first time, the researchers were also able to conduct large-scale investigations of the biological communities living directly on the lower side of the Arctic pack ice, with the help of a new type of under-ice trawl. "We had a polar cod in our net almost every time. This species is particularly adapted to life below the ice - it does not occur without ice." Dr. Hauke Flores explains the importance of sea ice as a habitat; she is in charge of this research topic at AWI. Sea ice physicists from AWI even used an under-ice robot to record the light incidence and algae distribution on the lower side of the ice. They detected the diatom Melosira artica in high concentrations. These single cell algae produce metre-long chains and form dense accumulations beneath the ice. Photos from the deep sea have shown that these algae drop to the bottom of the sea as a result of the melting ice. According to the AWI researchers, the rapid changes in the Arctic are therefore not restricted to the sea surface. Atlantic water flowing into the Arctic at a depth of several hundred metres has an elevated temperature and salinity which could be measured down to a depth of several thousands of metres in the Arctic Basins. Images and measurements of the bottom of the sea showed that the deep sea of the Central Arctic is not a desert, but that sea cucumbers, sponges, feather stars and sea anemones gather to feed on the sea algae. The warm temperatures, the retreat of the ice and the greater light availability beneath the ice causes the seasonality of the Central Arctic to shift. The production and the export of algae is taking place earlier, as the results of annually anchored sediment traps show. Due to the very thin ice cover, the Polarstern was able to navigate further North and later in the year. Hence the sea ice physicists were able to collect important data at the start of the freezing period. These measurements on the newly formed thin ice are important because this type of sea ice will occur more frequently in the future.